Since 2015 I have spent many months living in a remote Transylvanian village in the heart of Romania. Exploring this peaceful, beautifully-preserved corner of Europe, I quickly fell in love with the place, its kind people, the gentle rhythm of rural life and its crafts. It was the countless artisans I met who really inspired me, in particular the UNESCO-recognized ceramicists I found in Vâlcea county, deep in the Carpathian Mountains. I brought a handful of their vibrantly decorated, rustic plates back home. We use them every day. I love them and I hope you do too! Every item is handmade by Doina and Ileana, a mother and daughter team whose family have been ceramicists for generations. Each piece is thrown in their home studios, then skilfully hand-painted in a traditional design. 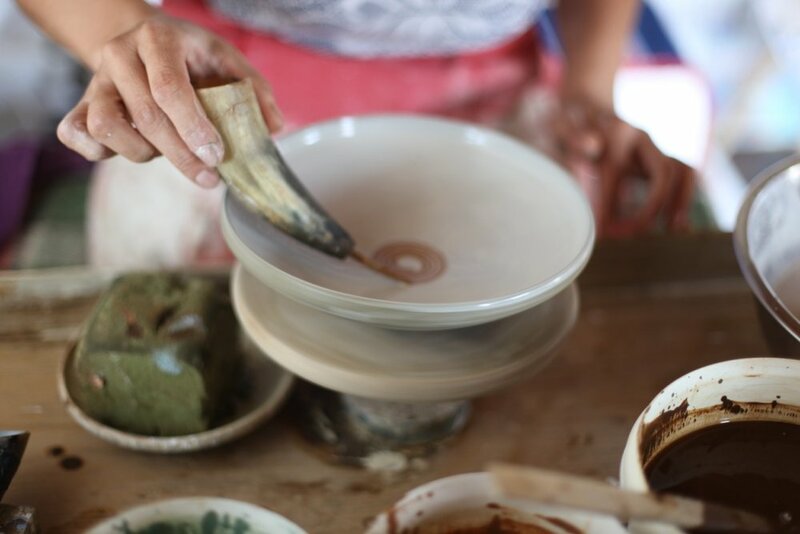 The glaze is poured freehand from a cow horn with a goose feather nib. The patterns Doina and Ileana create are their interpretation of the designs made famous by local master potter Victor Vicsoreanu. Once dried, the plates and bowls are tightly stacked in Doina's traditional wood-fired kiln in her garden shed. Keeping the kiln at the right temperature, stoking the fire and eventually emptying the still-hot ceramics is not a job for the faint-hearted, particularly in the height of summer. Made only during the spring and summer, when the weather is warm enough for the clay to dry, this pottery bears all the marks of its makers. It is rough and rustic, authentic and charming. No two pieces are exactly the same, each one telling the story of its journey to your table.